(Deptford Pink - Maiden Pink (Dianthus armeria) - 04) The Deptford Pink flowers in the top of this picture are shown in their actual size of 1/2 inch. According to the literature, they can grow as tall as 24 inches, but the ones we have seen are not over 12 inches. The name of this wildflower came from Deptford, England where there once were abundant fields of this little beauty, but now this area is part of industrialized London. (Deptford Pink - Maiden Pink (Dianthus armeria) - 05) Deptford Pink buds and blossom with a long-antennaed visitor. There is always another of God's wondrous creations for us to encounter and enjoy, if we simply take the time to do so. 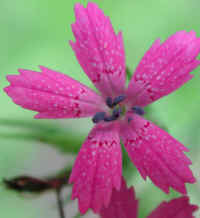 These wildflowers bloom from May to July. 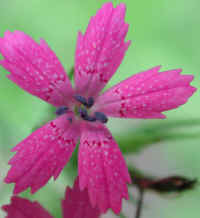 (Deptford Pink - Maiden Pink (Dianthus armeria) - 03) We have had some problems in accurately identifying this flower. 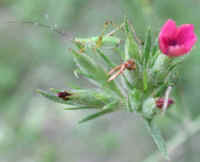 The literature says that Deptford Pinks have 10 stamens, while this one has only 5. 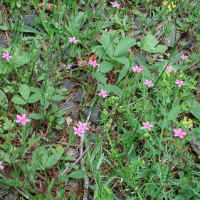 There is a similar species called Maiden Pink, but the literature says that it has only one flower on each stem, while the Deptford Pink has several flowers on each stem as this one does.